If you're not from the sleepy northern Chicago suburb, beer probably isn't the first thing that comes to mind when you think of Lake Bluff, Illinois. Perhaps it's a nice looking village that whisks by when you're on your evening Metra commute. Perhaps it's the proximity to the small but picturesque beach less than a mile from the train. We're here to tell you that you should hop on the Metra, get on your bike, jump in your car, or pretty much do whatever it takes to spend an afternoon in cozy little Lake Bluff. Why? Lake Bluff Brewing Company and brewer/jack-of-all-trades Pato Thornycroft are brewing award-winning beer that will appeal to any type of beer drinker. And they're doing this in a comfortable, but still quirky-enough-to-be-interesting, setting. As we discovered on a Sunday morning bike ride from the city, there's a whole lot more to Lake Bluff and it's new brewing company than you might be aware. I grew up in this area. I lived elsewhere for seven years, and then moved back here. I saw there was a brewery opening and was like "Oh my God, yeah!" So I started as a cook, and later became a bartender – which allowed me to get into brewing with the assistant brewer at the time. He taught me how to brew in his garage. From there, the master brewer asked me to clean some tanks, CMC the kettle, and sit in on a few brews with him. I was like "alright!" Then the manager and the assistant brewer quit at the same time, so I took over both positions while still bartending. I've been doing that for a little over a year and a half now. Sounds like you've taken on a lot since you've been here. Were you a big craft beer guy when you started? I didn't know anything about craft beer when I came here. I was living in DeKalb and bartending there, and we had an awesome beer selection. And I knew what I liked, but I just didn't know how to describe it. I knew that I didn't like IPAs, 'cause I don't like primarily bitter beers. I did know that I loved stouts, but I didn't know why. When I started working here, they hired me just because I had bartending experience. Someone asked me what our 'session' was, and I told them it was our Hard Tail Imperial IPA. Then my friend – who told me everything I know about brewing – facepalmed so hard. He was like, "You idiot!" But it drove me. I don't like not learning things. So if something is broke, I'll learn how to fix it. If I want to learn how to make bread, I'll learn how to make bread. But it is really cool to be pushed to learn something you know nothing about. The next thing I am going to start learning is wine – just because it's another thing I can learn, understand, and then compare for someone who comes in here and says "I'm not a beer drinker, I'm a wine drinker." Well, 'you should try our Belgian Tripel then.' I could compare it to a style of white wine they may enjoy. So, its important to be well-rounded. What's the community like around here? Small town...lots of families, lots of kids. I would say that the age range is 30-65. There is a lot of old money in this town, as well as new money that's coming in. There is a very small 21-26 population, but it's pretty much like everyone we went to high school with. The brewery sits a hundred or so yards from the Robert McClory Bike Path. Do you get a lot of cyclists in here? Oh, tons! The bike trail is huge. That draws in a lot of people from Deerfield, Winnetka, Highland Park. It also draws in people from Chicago. We had one dude who rode his bike from Chicago, had a few beers, rode back to Half Acre, had a few beers, then came back here. I was like, "how did you do that in a four hour time frame!?" Dude was a machine. We even have a few beers named after cycling, Hardtail and Derailer. The owners are also heavily bike-oriented dudes. The brewery opened in 2010, so you're fairly new. What's it been like, especially being in a smaller town, trying to educate people about craft beer that might not normally have access to something like this? It's been very cool. Since I started working here, I got my first level Cicerone done and I'm working on the second. When we started this tap list, it didn't have SRM (Standard Reference Method), BU:GU, or even ABV listed. It just had the prices on there and I thought that was pretty lame. So, slowly week-by-week, I would throw on another category. People would ask 'what's SRM? ', for example, and I could help educate them about color intensity. People have expanded their tastes too. We've had regular customers who, since the day we opened, have never tried anything beyond Inspiration (Pale Ale). But then all of a sudden, a couple weeks ago, one of my oldest customers switched his beer – saying he never knew that beer could be this 'awesome.' Education from this side of the bar, outwards, is very important – just as much as it is for me to educate myself from the brew house. My favorite thing to hear is "Oh, I don't like beer." So you start asking questions like what do you feel about chocolate? What do you feel about citrus? Then even after that, I'll ask what sort of mood are you in? They always ask, "What does that have to do with it?" Well, if you are pretty pissed off, a barley wine is going to treat you very well. So beyond brewing, it's being a part of the community? Yeah definitely. I grew up in this town, and there was never anything like this. This was a dry city until seven or eight years ago. So for a brewery to open up – one that's pretty weird, likes to blast some rock & roll records, and sling some pretty heavy beers – it was a very big deal. We are so gracious of the village and we always like to help out around town. Did it take a lot of convincing with local government to approve something like this? Oh definitely, this was not an easy establishment. Just because it's the North Shore suburbs, where people like their calm, peace, and quiet. Some people said a brewery could attract "city folk." But really, there were more speculations about liquor licenses, talking about logistics, how to contain it, etc. The town responded awesomely to it. It's almost impossible to get a seat in here on a Friday night in the summertime. It's a great problem to have, the more people we have in here the more things we can do in the future. What would you say is your most popular beer? The most popular among the general population, and the one we sell the most of, is Honey Badger (Golden Ale). We go through four kegs a week, like clockwork. Amongst the beer drinking community it would be Skull and Bones, our double pale ale. What about some of your more "out there" beers. Which one is your favorite right now? Of these right now, I would say Gamma Ray is always my favorite. But Jack the Sipper, I'd would drink all day if it wouldn't brutalize my brain. It is a very powerful beer in every sense of the word. We aged it for a year and it pulled out a lot of whisky flavor. You have a small space. Do you do all your barrel-aging onsite? Yeah everything is aged here. We have a little basement storage area with 13 barrels. Soon, we are bringing up our vanilla porter, our American-style barley wine, and then Kosmonaut, which is the big one. That's coming up in October and won the US Open Beer Championship last year for the Wood-aged Imperial Stout category. Do you use a specific barrel? Yeah we only use barrels from Koval at the moment. Mike, the master brewer, got started brewing at Metropolitan – which is right next to Koval. So they would always trade beers. When he came over here to be master brewer he asked if he could get some barrels, and they were happy to help out. They're really good guys. The fact that we won an award with their barrel means as much for them as it does for us. We are also going to be doing some experiments with different barrels. We're working with Terlato Wine Company to try and obtain some Chardonnay barrels for our Belgian Tripel. 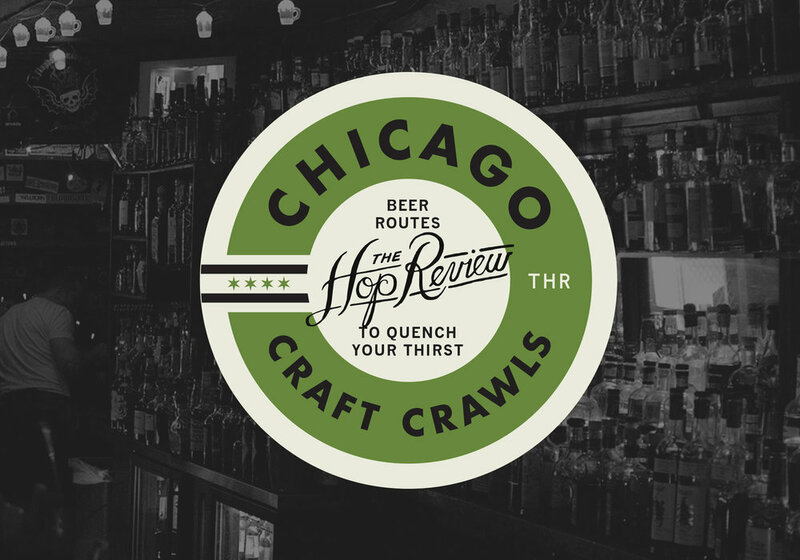 We're seeing more and more collaboration brews, especially in Chicago. Do you have any planned? Ok, final question. When you're not drinking Lake Bluff, what's in your glass? My go-to is definitely Old Chub, from Oskar Blues. I recently had it on nitro which was a mind-bending experience. I also have a go-to cocktail. The Sazerac. I will drink a million of those if I'm not drinking beer. Also, this time of year for me, it's Akari Shogun from Half Acre. It's one of my favorite beers. A huge thank you to Pato for opening his doors a little early on a Sunday morning to let a bunch of sweaty cyclists in for a beer. If you'd like stop in yourself, find your way to the Robert McClory Bike Path, or hop on the UP-N Metra line. For more information, check out Lake Bluff Brewing Company on Facebook and Twitter.